This piece was originally published by KQED Food’s Bay Area Bites. Sorry, Oaklanders: CUESA Executive Director Marcy Coburn can’t promise to give Jack London Square its very own Goat Festival. But there are plenty other positive developments on offer now that CUESA (Center for Urban Education about Sustainable Agriculture) has taken over the management of Jack London Square’s weekly farmers market, held year-round on Sundays from 9AM to 2PM. 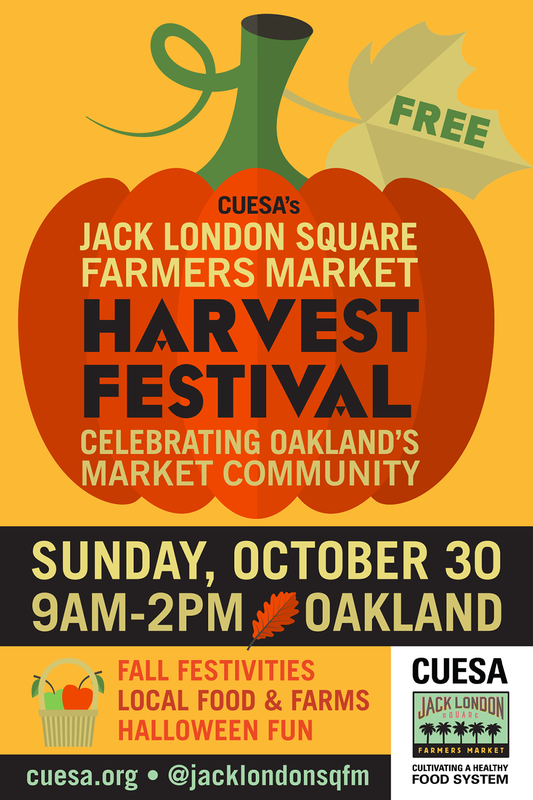 This Sunday, October 30, CUESA is throwing a free Harvest Festival, rain or shine, to celebrate the seasonal bounty of the market’s 40-plus vendors. It will be a pumpkin-filled debutante party trumpeting the market’s new management to those in the neighborhood who may not have noticed, and to encourage East Bay denizens from all over to make the waterside trek to check it out. The Harvest Festival–which will happen even if umbrellas are necessary–has lots of kid-friendly things, from mini-pumpkin decorating to DIY apple cider pressing and seed ball making. There’s even a pie contest judged by the likes of Mani Niall, chef-owner of Sweet Bar Bakery, Margo True, food editor of Sunset magazine, and Meg Ray, owner of Miette, among others. Recently, we caught up with Coburn to find out what CUESA is bringing to the market, now that they’ve been in charge since May 2016. Previously, the market had been run by the Pacific Coast Farmers Market Association, which runs over 60 markets around the Bay Area. But when ownership of the Jack London Square development changed hands this year, there was a mutual reaching out between the CIM Group, the new owners, and the staff at CUESA, to discuss a partnership. For CUESA, it was a strategic step, part of a long-range plan of slow but thoughtful growth beyond the Ferry Plaza Farmers Market, the widely renowned market that has drawn locals and tourists alike to the eastern edge of the City since 1993. The Jack London Square Farmers Market has an even longer history—a farmers market has been in operation there for 28 years, but it remains a much lesser known market than, say, the Temescal, Grand Lake, or Old Oakland markets, which collectively draw the largest Oakland crowds. “A lot of our staff live in Oakland,” said Coburn, herself an Oakland homeowner, who previously worked in Jack London Square as the executive director of the Eat Real Festival and the Food Craft Institute. A lot of chefs who cook in San Francisco also live across the Bay, she noted, and a lot of San Francisco restauranteurs are expanding into Oakland. “We’re bringing our operational expertise”—the Ferry Plaza market is routinely mentioned in top-ten lists of the country’s best farmers markets—as well as a highly hands-on staff and a dedicated crew of longtime volunteers. “We have the staff resources for really fun events, we have great relationships with chefs, and we have a reputation for bringing in really great farms,” Coburn said. With only two markets to run, they’ll have four to six people on site at the Jack London Square market every week to help with both customer and vendor concerns. Part of CUESA’s mission is working closely with local farms and farmers, and to that end, they frequently talk sales figures, offer booth advice, and try to connect farmers with local chefs. They host an annual mandatory sellers’ meeting, to explain any state or city-mandated changes in agricultural policy, permits, or politics. They send out a monthly newsletter to both sellers and chefs, promoting upcoming demos and highlighting what’s in season, as well as anything unique a particular farmer might have to offer. “We’re not looking to reproduce what we have in San Francisco,” Coburn said. “We built our market in San Francisco around 22 years of community needs and feedback.” She is looking forward to finding out what the surrounding Oakland communities want from this market. It’s an evolving neighborhood, criss-crossed with rail lines, with old factories next to sleek live-work lofts, the headquarters of Blue Bottle Coffee and Belcampo Meat Co. just a couple blocks from Franklin Street’s wholesale produce markets. So far, CUESA has extended the contracts of all the sellers currently at the market through the end of the year, and hopes to retain as many as it can in 2017, while also making room for new farms to join as needed. What about affordability? While it’s the rare farmer indeed who does more than break even selling kale and peppers, Ferry Plaza has long had the reputation as a pricy market, someplace that can feel more like a check-off for a visiting foodie’s bucket list (or a chance to Instagram that porchetta sandwich) than a place for locals to stock up on carrots or tomatoes. Coburn is quick to point out that the farmers, not CUESA, set their own prices. However, she also notes that right now, the prices at Jack London are definitely lower overall than those in San Francisco, and the market is rarely crowded, which might come as a surprise to those who only know the waterfront setting from the jam-packed Eat Real Festival. And who knows? Come next April, there might just be a herd of adorable four-footed friends ready for petting on this side of the Bay. Surely the Berkeley Lab could spare a few? Jack London Square Farmers Market photos by Tory Putnam. Marcy Coburn portrait by Amanda Lynn Photography.